1- The aggression of Russia began on 30/9/2015 on Syria after the agreement with America [the bombing immediately preceded the meeting between Obama and Putin on 29/9/2015 which lasted 90 minutes … The Ukrainian crisis occupied the first part while the two presidents focused on the situation in Syria in the remaining part. The results of this meeting immediately showed, and on 30/9/2015 the Council of the Russian Federation unanimously approved Putin’s request to use the Russian air force in Syria…” (Russia Today, 30/9/2015)]. America was aware that Russia may, if the war prolongs and the “quagmire” frustrates it, rush into uncalculated actions by America. So it wanted to make Turkey’s Erdogan as its eyes to adjust the Russian rhythm according to the limits of the United States. So it instructed Turkey to engage with Russia in a similar alliance until Turkey controls the rhythm of Russian attacks so as not to exceed the limits required, which is not to eliminate the opposition gathered in Idlib before the end of the US project of the final solution to the Syrian crisis because America wants to keep the opposition to negotiate with the regime in the final solution. 2- But the problem was that Turkey appeared to be visibly opposed with Russia and the regime, that is, they are enemies. Then the issue worsened when the Russian plane was shot down by Turkish pilots on 24/11/2015 and Erdogan rode the wave! And refused to apologize. Because America was interested in Turkey’s rapprochement with Russia, its opinion was that Turkey apologize and converge with Russia, and so this happened. After Turkey said that the Russian plane violated the airspace and does not deserve an apology, yet it apologized on 27/6/2016: [Dmitry Peskov, Press Secretary of the Kremlin said: “The Turkish president expressed his warm sympathy and condolences to the family of the Russian pilot who was killed and apologized,” adding: “Erdogan will do all he can to reform the traditionally friendly relations between Turkey and Russia,” (Al-Arabiya, 27/06/2016)]. It was also like a compensation [the mayor of the Turkish Kemer resort has proposed to grant a house to the killed pilot’s family during a meeting with Russian Consul in the city of Antalya, held earlier on Friday … (Russia Today 07/01/2016)]. After Putin was the enemy that bombed the people, especially Mount Turkoman, talk with him became in a friendly atmosphere. Erdogan contacted Putin by phone on 29/6/2016 (According to sources in the Turkish presidency, the call was made in a very friendly atmosphere … (Al-Arabi Al Jadeed, 29/6/2016)). And Turkey and Russia became like friends, and Erdogan calls Putin his friend although Russia continues to bomb the Muslims in Syria! 5- Russia was happy about the deal, as it focuses on gaining material advantages. The S-400 deal with Turkey is in the range of $ 2.5 billion. Moscow wants to compensate for its losses due to the European-American sanctions and the boycott of many of them of the Russian oil and gas. This deal is a new bond between Russia and Turkey, and when Turkey put a condition to complete the joint production deal [the Turkish newspaper, Aksham, cited the Turkish Foreign Minister Mouloud Oglu’s statement on Monday 9/10/2017 that his country may seek an agreement with another country to have a missile defense system if Russia did not agree to the joint production of the S-400 missiles system. (DW on 9/10/2017)]. Russia refused the joint production, so Turkey withdrew and agreed to the deal to stop the Russian attack on Idlib that Russia has actually launched [AFP – At least 28 civilians were killed on Friday/Saturday night in air raids on the town of Armanaz in the province of Idlib, which is among the areas of reducing tensions in north-west Syria, according to The Syrian Observatory for Human Rights there were 12 dead declared in a previous outcome announced by the Observatory on Friday evening … Idlib province is a declared a de-escalation zone under the Astana agreement, yet it was attacked by Russia … Rami Abdul Rahman, director of the Observatory pointed to: “The implementation of warplanes of a second raid targeted the town of Armanaz in the north-western Idlib district, the planes bombed the areas of the first raid, during the process of rescuing the wounded and lifting the stranded from the ruins of buildings destroyed by warplanes. The Observatory said on the other hand that 13 civilians were killed in bombardments in different areas of the province. Idlib province has been subjected to two weeks of Russian raids and other intensive Syrian raids … (Gulf News on 30/09/2017)] and so the deal was held without joint production! Erdogan said on his return from a trip to Ukraine and Serbia, [“There will be no joint production of the first phase of the S-400 missiles, which will be purchased by his country”, but in the second stage, “we will take steps on joint production…” and the S-400 is a sophisticated missiles capable of destroying targets from long distances, and the number of targets that can be followed simultaneously is three hundred, and the destruction of aircraft is between 3 and 240 kilometers, and can destroy all types of fighters and intercepting winged missiles … Besides its destructive ability, the S-400 systemonly needs five minutes to be ready for launch A, the Russian army is supplied with it since 2007 … (Al Jazeera on 29/12/2017)]. 6- Naturally, America took a calm position on the agreement, and was almost reserved, despite Turkey being a member of NATO. And the organization of weapons in the alliance is a Western organization and is incompatible with the weapons of Russia, especially the S400, which can penetrate the Western system in the alliance. But America and the Alliance have shown a lenient position for two factors: The first is that America needs Russia and Turkey to remain close to prevent Russia from attacking Idlib before the completion of the final American solution to the Syrian crisis. And the second is that America rules out the implementation of this deal as long as Turkey is in NATO. America does not allow Turkey to introduce a Russian system inside the Western system in NATO. For these two considerations, America had calm and near reserved position! [… Washington continues to insist on its reservation to Turkey’s purchase of these missiles, and NATO believes that Turkey has the right to acquire weapons that helps it to maintain its security after Ankara announced that the main system will not be integrated into NATO systems … (Asharq Al-Awsat 28 /12/2017)]. A- Turkey did not agree to a comprehensive war on Idlib. (The Turkish minister considered that the “terrorists” should be identified and fought, and it is not right to launch a full-scale war on Idlib and bombard it indiscriminately) I’nab Baladi 14/8/2018. Turkey’s opposition to the war was clearly demonstrated during the Tehran conference between the presidents of Russia, Turkey and Iran. Turkey, in a surprise manner to Russia, highlighted its fears of the war against Idlib and the influx of refugees to it. It embarrassed Russia by considering the war as a tool to eliminate the political solution in Syria. [Recep Tayyip Erdogan, the Turkish President said on Friday that the continuing attacks on the province of Idlib, controlled by the opposition, will lead to the collapse of the political process in Syria … (Al-Youm As-Sabi’ 7/9/2018)]. And then with the rise of the American tone against the Russian efforts to the war on Idlib, Turkey has filled the points of control in Idlib with weapons; those points established within the agreement to reduce the escalation with the Russian and Iranian, [field sources and witnesses told Sky News Arabia, Sunday, a Turkish military convoy headed to the city of Idlib, adjacent to the border with Turkey, controlled by the Syrian opposition factions and other groups. The sources said that the Turkish military convoy entered the Syrian territory from the Kafr Lusin crossing towards Idlib and its countryside, north of Syria, it contained tanks, military equipment and was carrying ammunition … (Sky News Arabia 09/09/2018)]. B- The Americans offer the “Greek solution,” that is, putting the Russian missiles in storage and leaving them to rust in exchange for the purchase of Patriot batteries from the United States, which cost $3 and a half billion. The backdrop of the story of the Russian missiles in Greece is that Moscow sold them originally to Cyprus, which paid for it, but Ankara’s strong objections forced Athens to keep them to avoid a serious crisis with Turkey. Which means that the Turks will pay this amount in addition to two and a half billion dollars for Russian missiles! Certainly this suits Donald Trump, but its high cost will put the Turkish government in the face of the Turkish opposition’s attack, which will have the right to accuse the government of wasting the Turkish people’s money due to the government’s foreign policy mistakes. It seems that the most likely possibility is the first (point A), since it is noted that the current statements from the parties to the case paving the way for such a thing, for example the above-mentioned Shanahan statement on 2/4/2019, as well as the statement of the Russian Deputy Prime Minister for Military Industrialization: [There is no fear that Turkey could drop its deal on the S-400. (Al Jazeera on 3/4/2019)]. 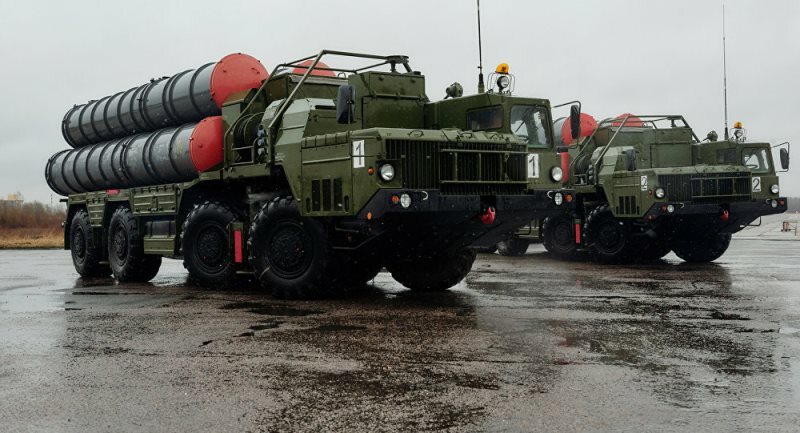 And also what was reported by Al Jazeera on the same day 3/4/2019: [the Chairman of the Defence Committee of the Russian Duma, Vladimir Shamanov, did not rule out the possibility of Turkey’s abandonment of the S-400 missile system deal with Russia … (Al Jazeera Net on 3/4/2019)], and also what was quoted by Al Arabiya Al Hadath Alyoum 4/4/2019: (Turkey calls for a working group with Washington to discuss the dangers of the Russian missile system S400). All this makes the first possibility likely, of not ratifying the missile deal with Russia, that is, to cancel the deal.